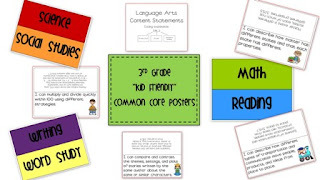 If you'd like to learn more about these Common Core "Kid Friendly" posters, click on the pictures below! 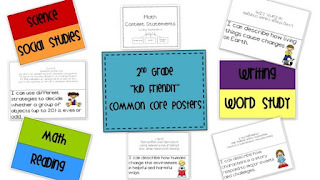 1st Grade Common Core Standards Posters- "Kid Friendly"
2nd Grade Common Core Standards Posters- "Kid Friendly"
3rd Grade Common Core Standards Posters- "Kid Friendly"
4th Grade Common Core Standards Posters- "Kid Friendly"
LoL! I am posting about how I organize mine in my post tomorrow! Great minds think alike! Hey there, Erin! I just downloaded your AMAZING standard pack for 4th grade and I am so excited to print it out, laminate it, and put it up!! Woohoo! THANKS! 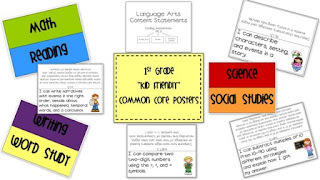 I've recently discovered your blog (which I love) and I love that we have some things in common... we're both named Erin, and we both teach in room 112 at our school... amazing coincidences. Happy back to school!